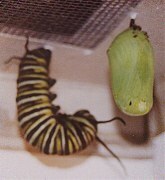 A caterpillar in the J formation (just before becoming a chrysalis) and a chrysalis. Both are attached by their silk to the screened lid of the raising box. The raising box is simply a shoe box. A rectangular section of the top is cut out, leaving about an inch of the top all the way around. I then use duct tape to attach a piece of nylon screen -- taping all the way around as the caterpillars will wander out if they can. The box top, with the chrsalysids attached, in the emergence cage. The raising cage, based on a design described on the Monarch Watch site, provides the emerging butterflies with plenty of room to expand their wings. After they emerge, pump up their wings, and begin moving around, I release them outdoors. The cage, like the raising box, was made with items on hand (a large metal ring, a circle of cardboard, thread) plus a bit less than half of a yard of bridal veil which I bought for less than $3.00/yard.